I have a post running over at SC Johnson’s Family Economics on creating thoughtful “Get Well” comfort kits. Most times you can put a kit together without ever leaving the house, using things you already have. 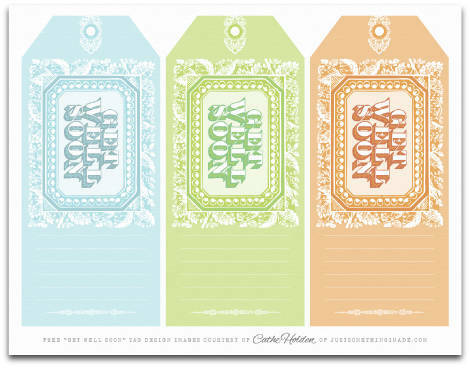 So, in the spirit of not leaving the house, I created some GET WELL SOON hang tags to help you out! Simply download, print, trim, punch, string, add a handwritten message and attach to your care package. Click on tag image to download. For more information on creating “Get Well” comfort kits, click HERE. This entry was posted in Family Economics, Free Clip Art, Free digital collage sheets, Free digital downloads, Free Jpgs, Free PDF files, Greeting Cards, SC Johnson and tagged Free PDF digital download. Bookmark the permalink. Thank you – these are great! Cathe your tags are beautiful, thanks for sharing! thanks for sharing your tags and your comfort-kit list…they will definitely come in handy. 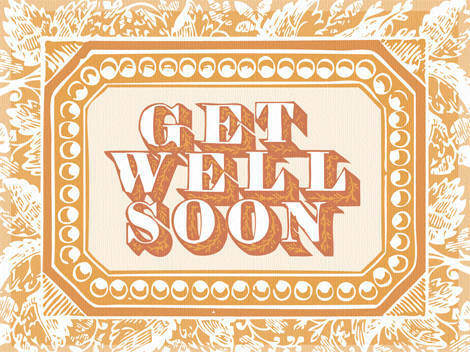 Lovely design … Get Well sentiment are something I have a shortage of in my card making collection. i just need to tell you that i love your things. I look every day and see something new. just wanted to tell you that. thank you. Those are so lovely… and cheerful! I love the idea of being able to offer something pretty, thoughtful and practical to a friend who is under the weather. Thank you so much for the ideas and especially for the “get well soon” tags. You make it so easy to present homemade, attractive gifts. thanks for sharing. They are way to cool! Absolutely tags are my all time favorites and yours are just wonderful!!! TFS!!! Love these. I will be bookmarking this one to keep for future use. Amy from Living Locurto sent me! Thank you for the beautiful get well cards free download!! Hi! I am trying to find some DIY printable luggage tags JUST like this, but with this design, but blank without words! I wanted to write peoples names on them for the rehearsal dinner the night before our wedding! How do you think I could do this?! I love this design!!! I am very much a fan of your products and website. I truly do appreciate the Branding Kit that you put together for small companies. I am trying to start a small business on etsy selling soap while at the same time dealing with several invisible, chronic illnesses. The most recent diagnosis to add to the growing list is Rheumatoid Arthritis. I am actually thankful to have a concrete diagnosis as I only had syndromes previously. Some drs, friends, and even family don’t treat you like you are actually sick when you “only have a syndrome.” Anyway, I have been thinking for a while that you always see “Get Well Soon” cards in stores. One out of three people are diagnosed with chronic illnesses. For us, we aren’t “Getting Well” any time soon. I am wondering if you would consider putting together some specially designed tages or labels which might say something like, “Get Relatively Well” 😉 or some other catch phrase. I am not the most creative at such things as wording. There are however some phrases to avoid like, “Get Well Soon.” It implies a lack of understanding concerning chronic illness. Most of illnesses will peak or are progressive. There is not usually a cure, a diet to improve the symptoms, or a magic pill. I hope you understand the intention of this message. Perhaps you or someone who sees this might have some ideas or suggestions about such a project. My blog is juliesspoonfulofsugar.wordpress.com and my shop is etsy.com/shop/JuliesSugarSoaps. Once again, Love your website! I love them all, but I just love the blue tag. Thank you for sharing with all of us.